Albergueweb.com.mx Review 2019: Is Albergueweb.com.mx a Good Hosting? Albergueweb.com.mx is a prominent web hosting services provider in Mexico. It also offers a wide range of other services such as web design, web optimization, and domain registration. Albergueweb.com.mx has been offering web hosting and domain registration services for more than ten years in Mexico. All of its hosting plans come pre-installed with Joomla and WordPress. The company also offers domain registration, reseller plans, web design and programming, and web positioning. The Albergueweb.com.mx website is only available in Spanish. Apart from these, if customers already have a WordPress or Joomla template that they want to adapt, Albergueweb.com.mx can provide that service in a cost-effective way. Also, if customers need a greater space allocation than what’s mentioned in the hosting plans, the company can offer personalized quotes to meet their customers’ requirements. If none of the plans suit your needs, you can email your specific needs to the company to receive a personalized quote. 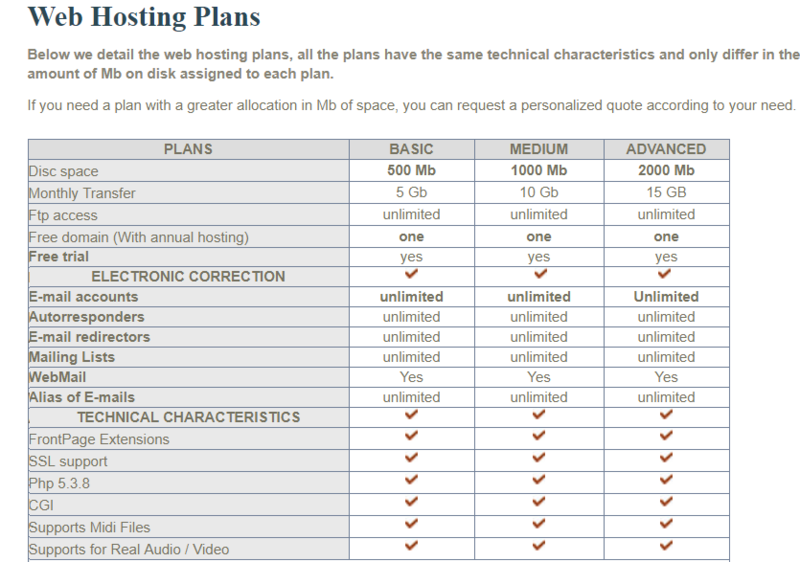 You can also change your existing hosting plan whenever you deem fit. For that, you’ll need to send an email to the company with a term of fifteen days before your monthly billing cycle’s expiration. A unique feature of Albergueweb.com.mx is the availability of more than sixty pre-installed programs with all hosting plans. To use them, you’ll just need to activate them right from your control panel. The company also offers support for MIDI files as well as real video/audio. Since Albergueweb.com.mx offers Web Host Manager (WHM) with cPanel, you can use this powerful administrative tool to configure your account fast, ensure efficient file management and account security, get server backups, and do a lot more. Albergueweb.com.mx’s web hosting plans can be considered cheap. You can pay for the plans in Mexican Peso and through Santander-Serfin bank deposit or by card via PayPal. The company offers three billing cycles – quarterly, bi-annual, and annual. To check the quality of Albergueweb.com.mx’s services, you can request a free trial for seven days. The customer support team of Albergueweb.com.mx can be contacted through an online form or email. The company also mentions an online chat but I couldn’t find it. While trying to access it, I reached a “client area”, clicking on which took me further to a “404 Not Found” error page. I sent an exploratory email to Albergueweb.com.mx but it went unanswered. The company offers technical support every day of the week (from 9:00 a.m. to 8:00 p.m.) but I guess I am not eligible for it (as I’m a non-customer). The absence of a 24/7 customer support and live chat option were a big letdown for me. Albergueweb.com.mx also has a small FAQ section that may prove helpful to potential customers looking to take the self-help route. If you are looking for highly affordable hosting plans in Mexico, Albergueweb.com.mx can be a good option to fill this need. Wondering how Albergueweb.com.mx stacks up against other Web Hosting companies? Enter any other Web Hosting company and we will give you a side-by-side comparison.